Here are Three Delicious Recipes for Black Bean Soup to help you make a comfort food dinner using your slow cooker or your Instant Pot! Click to PIN Three Delicious Recipes for Black Bean Soup! One of these Three Delicious Recipes for Black Bean Soup can help with dinner on those busy evenings where you’re rushed for time but need to have dinner ready. Black Bean Soup is always a favorite, and these soups can help everyone get fed quickly so we’re tagging this post with our Friday Favorites! Are you a black bean soup fan? We’ve updated this post to include Instant Pot and Slow Cooker versions of black bean soup, all made with dried black beans. You can plan ahead and cook your black bean soup all day in the slow cooker, or use the Instant Pot for black bean soup in a hurry! Your next soup night should be a nice bowl of black bean soup that will warm everyone’s tummy! This Instant Pot Black Bean Soup from A Pinch of Healthy is a vegan meal that even meat lovers will love. Slow Cooker Black Bean Soup with Five Peppers and Ham from Andrea’s Recipes has a hambone thrown in to give an added boost in flavor. This one cooks all day and is ready for a delicious dinner! 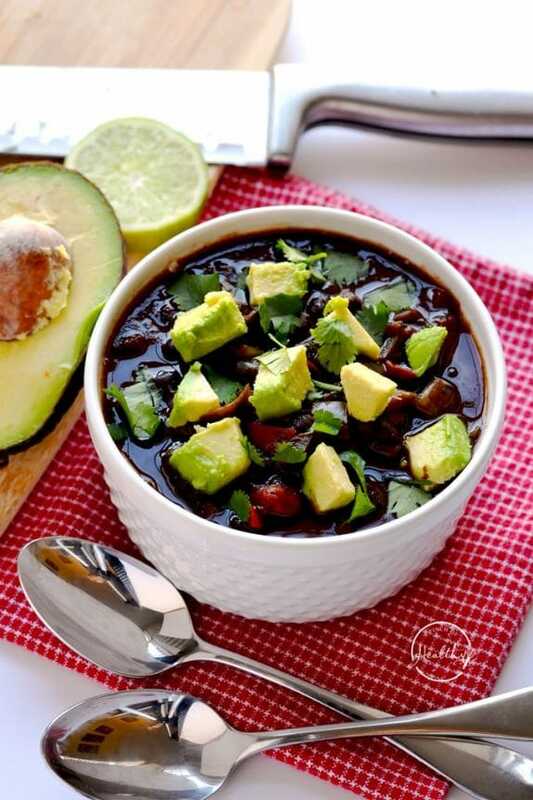 This Pressure Cooker Black Bean Soup from Two Sleevers is a “put all the ingredients in and cook” recipe, although you could cook the bacon and onions separately and add them later, too. Either way this sounds like a delicious meal for tonight! Use the Index Page for Soups or Stews to see all the slow cooker or pressure cooker soup recipes that have been featured on this site. I love soups like this! One hint, for those who don't eat ham (like me): use barbecue sauce to get some smoky flavor into your soup. Oooh, perfect timing on this one, Kalyn and Andrea, as I just picked up some black beans, have tomatoes and peppers that need to be used, and have several ham bones in the freezer to choose from. I'm soaking the beans now and will put this recipe in the slow cooker before I go to bed and let it cook while I'm sleeping tonight. It will be great for breakfast (and probably all my meals) tomorrow. Hubby is away and I find myself neglecting my meals, so this recipe is the perfect solution. 🙂 Thanks! Lydia, thanks for that tip. Such a good idea. Shirley, so glad this worked for you, enjoy!